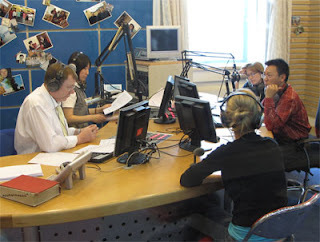 A group discussion with Bill Russo of Synergistics Limited and Bill Gaylord of Sun Faith International in the first hour of China Radio International's Today broadcast. Hello and welcome to Today – a two-hour news magazine coming to you live from our Beijing studio. I'm Chris Gelken. Joining me here on the desk is Ashley Eldridge and Xu Qinduo. We have a packed and varied show for you this morning. In the first hour we'll be taking a look at the auto industry, with a particular focus on the sector here in China. In the second hour, our panel of guests will discuss the latest round of economic talks between China and Great Britain - and what the agreements reached mean for both countries. Those and our regular features such as name that city and a couple of music breaks just to slow down the pace a little. Bill Russo and Edward Morcillo told senior executives at Cheung Kong Graduate School of Business a a recent seminar that while Chinese auto firms are racing hard to make overseas aquisitions, China should keep the brakes on, and be aware of specific risks they face in the areas of integration capability.